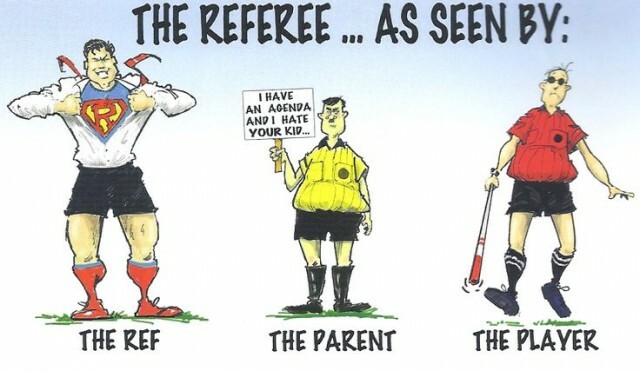 The primary responsibility of the referees officiating St. Charles CYC soccer matches is to ensure player safety. 2. New referees are should required to attend a classroom type referee training sessions put on by their parish or another parish this summer. These sessions are for NEW referees and all referees who want to improve/review their knowledge of the laws of the game and application of those laws. At these training sessions, which will last between 2.5 to 3 hours, we will spend a short time going over a few administrative parts of being a referee, then we will spend the bulk of the time discussing the laws of the game and application of those laws. 3. We will hold one referee field mechanic training session at the District level for ALL referees to attend, if they cannot attend one put on by their parish. (Attend one of these sessions) The time on the field will include proper referee positioning in the two man system, application of the rules of the game and anything else that needs to be covered while we are on the field. Since we will be spending the bulk of our time on the field, each participant should wear clothing that will be comfortable based on the weather conditions and bring something to drink. There are no guarantees that drinks will be provided, although we plan to do so. ALL REFEREES ARE HIGHLY ENCOURAGED TO ATTEND THE TRAINING AS IT WILL BE MOSTLY MECHANICS WORK THIS YEAR. New referees are required to attend the the training. Training dates, times and locations are listed below (or will be soon). 5. Most parish require referees that work games at their fields to be compliant with Archdiocesan child safety requirements, so anyone that is 18 years old and graduated from high school will likely be required to have completed the PGC program and background check requirements. The parishes and/or sport associations should be requiring each referee to submit a completed W-9 form for tax purposes too.